What Went Wrong with Silent Hill HD? A vocal fanbase demands changes to a flawed release. Digital Foundry finds out why. In an era where backwards compatibility has either been completely abandoned or stripped away via revised hardware, HD remasters make for an excellent alternative: why not take the games of yesteryear, port them over to current-generation consoles and make the most of precision high-definition visuals, higher frame-rates, cleaner artwork and improved texture filtering? In titles such as the God of War and Metal Gear Solid HD remasters, we've seen how, with careful nurturing, original PS2-era artwork can shine when rendered in high definition. There's no reason why the Silent Hill HD Collection couldn't have joined the ranks of those highly acclaimed titles, but unfortunately it's a deeply disappointing release - and the game's fanbase is not happy at all. There's actually an argument that the first game in the collection - Silent Hill 2 - has its unique atmosphere diminished in the transition to high definition. This is a game that is defined by its lo-fi visuals, where detail that isn't obscured by the thick, murky darkness is blended away to certain extent by an intentionally aggressive grain filter. The original artists at Konami would have built their artwork around this presentation, and the net result is that the HD version is unintentionally compromised as a result - the lack of texture detail in some areas becomes over-exposed in a way that was never intended by Konami's artists, and the game has a pin-sharp, pristine look entirely at odds with the ambience generated by the original release. Elsewhere, other effects (such as water) look fundamentally broken. Just as bad - if not worse - is the way in which the game's fog effects have been handled in both Xbox 360 and PlayStation versions of the HD Collection. Thin, wispy and insubstantial as opposed to thick and cloying, the look of the outdoor scenes is fundamentally transformed, with far-off detail that should never have been seen now painfully visible. It's almost as though complete layers of fog are now omitted from the overall presentation, meaning that the sense of real volume to the effect is now fundamentally lacking. 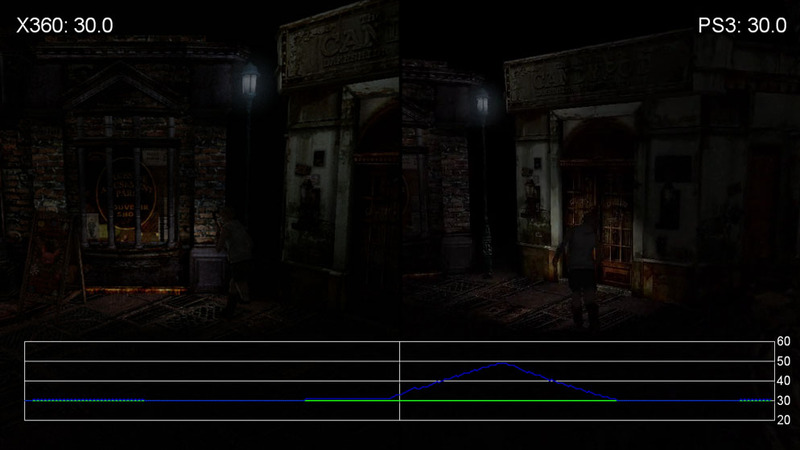 To illustrate the complaints levelled at the work, here's how the Xbox 360 version of the game compares up against the original PlayStation 2 version running on a PS3 via full backwards-compatibility. A PS3 mirror of the video is also available, as well as a head-to-head of the two HD remasters - not that there's actually much to tell them apart in terms of image quality. "Silent Hill 2 is a rare example of an HD remaster that is actually less satisfying to play than the original PlayStation 2 version of the game." At a basic level, conversion-smith Hijinx has opened out the field of view to accommodate a 16:9 presentation, and used original PS2 artwork assets in their entirety - little or no work appears to have been carried out to ensure they look good when rendered in HD. Aside from typography and UI elements, there is very little evidence that there has actually been any kind of actual "remastering" of original artwork at all - a far cry from the kind of extensive touch-up work carried out, for example, by Just Add Water with its superb Stranger's Wrath HD. Indeed, sometimes we get the impression that textures are actually being omitted - for example, the ground frequently looks bare compared to the PS2 game. The original Silent Hill games ran on hardware that didn't enjoy the benefits of hardware anti-aliasing and it appears that Hijinx hasn't made any effort to introduce it here. Resolution is confirmed at native 720p, but there's no evidence of any edge-smoothing as such. It's more than a little disappointing when directly compared with Bluepoint's work on the Metal Gear Solid HD Collection, where both MGS2 and its sequel flowed smoothly at 60 frames per second with multi-sampling anti-aliasing adding greatly to the quality of the overall presentation. Another disappointment concerns the video cinematics. Hijinx appears to have had no access to high-quality assets, so clumsy upscaling has been performed on the original videos, and in the process the aspect ratio has been shot to hell - expanded sideways in order to fill the 16:9 screen. These FMVs segued into gameplay almost perfectly in the original PS2 title, but the jump from muggy, badly blown-up video to ultra-pristine HD is very jarring on 360 and PS3. Where there has been a genuine attempt to refresh the game is in the inclusion of new voice acting, re-recorded from scratch with new talent for both Silent Hill 2 and its sequel. Opinion is somewhat divided on which version is best, but the good news is that Silent Hill 2 offers players the choice between both renditions. Bizarrely, the same choice is not afforded to players of the remastered Silent Hill 3, where only the re-recorded voices are an option. It's a frustrating inconsistency between the two games and an inexplicable decision certain to annoy the Silent Hill fanbase. It's a shame because, in a great many other respects, the HD version of Silent Hill 3 works rather well. Konami significantly upgraded the engine in the original game, allowing for higher-quality models, improved animation and more detailed artwork. Freed from the resolution constraints of the original hardware, the artwork has much more room to breathe and often looks quite impressive running at native 720p. While the remastering work is as basic as it is in Silent Hill 2, there's never really the sense that the original vision of the developer is being compromised - the thick grain filter of the previous game is gone, for example, and while the fog implementation remains an issue, the fact is that it is deployed in far fewer situations in the sequel and isn't a fundamental element of the game's visual make-up this time around. 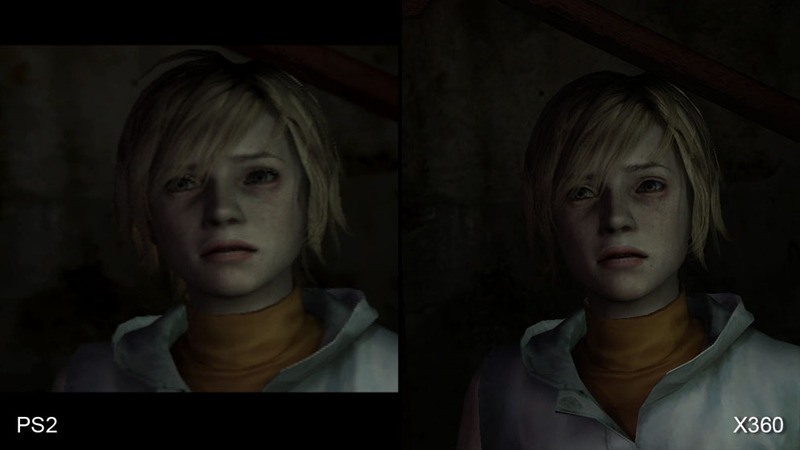 Here's how Silent Hill 3 looks compared between the original PS2 game and its PS3 counterpart. As with the previous comparison we also have an Xbox 360 version, plus an HD Collection head-to-head. "With Silent Hill 3, Konami significantly upgraded the engine, allowing for higher-quality models, improved animation and more detailed artwork, leading to a more successful HD port." Performance is an area in which the Silent Hill HD Collection has also received plenty of criticism, specifically from PlayStation 3 owners. The original PS2 titles operated with a 30 frames-per-second cap but were prone to dropping frames. However, in our tests the Xbox 360 version acquitted itself well, adhering to the same 30FPS limit as the original game and providing an absolutely rock-solid level of performance throughout. Unfortunately, the same cannot be said for the PlayStation 3 game. Similar to the other versions, v-sync is engaged but, for reasons unknown, frame-rate is completely unlocked. This results in a wildly varying performance level that changes at any given point - frames rendering either at 16.67ms or at 33.33ms, providing an inconsistent experience. Adding to the problem is the 4GB HDD install (yes, a mandatory install for two PS2 ports). Remarkably, reading in data from the hard drive appears to impact frame-rate during gameplay, resulting in a perceptible dip in performance when background assets appear to be streaming into memory. The result is that while average frame-rates are at their highest on PlayStation 3, the experience is deeply unsatisfactory, manifesting as a near-constant judder with many annoying pauses - something that is completely alien to original Silent Hill gameplay. One of the more curious elements behind the Silent Hill controversy is the delay in fixing issues brought to light by the gaming community. Remarkably, there's already been a patch for the US PlayStation 3 version, which apparently does very little at all (our UK version hasn't asked to be updated thus far) and, certainly, the notion of introducing a frame-rate cap shouldn't be too difficult - after all, it's already present on the Xbox 360 version of the game. "An unlocked frame-rate in combination with frequent stutter makes PS3 performance jarring and inconsistent. The games feel worse to play than the PlayStation 2 originals." The real question though is just how nobody at Hijinx HQ noticed this glaring difference between the two SKUs before gold masters were sent off. It's also equally difficult to imagine how most of the other glaring bugs made it through the quality control mechanisms of both Konami and the platform holders. It boggles the mind how the PS3 version's hard-drive-induced frame-rate drops, along with sections of out-of-sync audio, could have made their way into the final game in the first place. The lacklustre implementation of the fog in the two games is a little more understandable, but only up to a point. Transparency effects on the current-generation consoles are relatively expensive to implement. By comparison, the PS2 is a bandwidth monster, with the benefit of operating at a much lower resolution. That said, we have to remember that GPU resources elsewhere are hardly being taxed - these games utilise low-poly models by today's standards and the original textures would need to have been crammed into just 4MB of video RAM. Also, with a set 30 frames-per-second performance target (on 360 at least), it's difficult to imagine that there's anything other than a surfeit of rendering time considering the relatively basic level of the visuals on offer here. Complaints have been levelled at Konami that the development studio tasked with carrying out this HD remaster doesn't have that much experience with high-profile Xbox 360 and PS3 projects, and there's certainly a feeling that the power of the current-gen platforms isn't being tapped that much here: the notion of PS2-era games requiring a 4GB mandatory install on Sony's current console rings alarm bells, and when compared to the Metal Gear Solid HD Collection in terms of frame-rate and image quality, the technical inadequacies of these Silent Hill ports are swiftly brought sharply into focus. In the past, we've raised concerns about the lack of effort being put into some of these HD ports. Sometimes the quality of the original assets just isn't good enough for an HD presentation, while on other occasions the original games have simply aged very, very badly and simply can't compete with modern games. With titles like the recently released Devil May Cry: HD Collection, there's the sense that very little effort has gone into the conversion work and the games simply deserved better treatment. 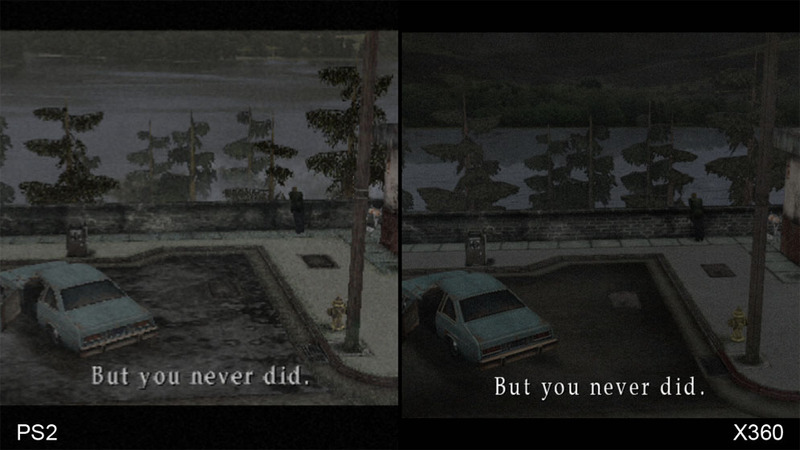 But with Silent Hill HD, we see something arguably worse: a port that doesn't play as well as the original games.